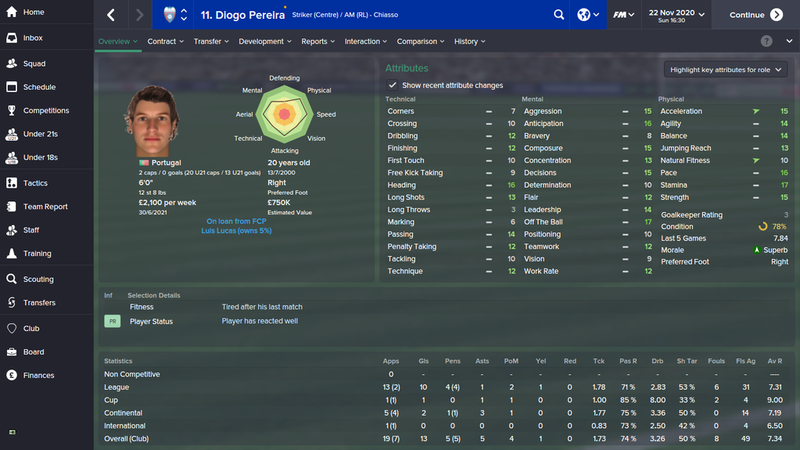 Is it best to loan out young players on Football Manager? When you are playing football manager hopefully you will be focusing on developing a youth system within your club. Recently in my Swiss gameplay save, I have been trying to operate a moneyball approach. Focusing on signing players between the age of 20-22, looking for free players and players who's transfer value is lower than they are worth, so looking for transfer listed players or players from lesser known nations that I can develop to sell on for a good profit. Part of the moneyball approach on football manager is to also develop players from your own youth team, this of course has a number of benefits. You get players for free, they will count towards your home grown quota and it can be very rewarding as a manager to develop players from your own academy. Part of the player development system you operate on football manager should include loaning out your younger players. I like to think of it like this, so you have a player who is 18 years old, he will not be starting at least 10 games for your club over the course of the season, plus getting a number of decent sub appearances. So how do you develop a player who will not be playing first team football? Well one way would be to loan the player out. I consider match practice as the fuel to develop your players. Using a car analogy, training I consider to be the parts of the car, so if a player has good attributes then that is like having better parts for a car. Tutoring should be considered as the brand of the car, so a professional player you are looking at a Lamborghini and a player with low determination should be considered to be a Volvo (no offence to people who drive Volvos!). So lets say you have an 18 year old that has a professional personality and good attributes (a Lamborghini with a good engine), he needs to get fuel to develop as a player and move on. So you need to give him game time. If he cant get the game time at your club then make sure you loan him out so he can get it. Moneyball teaches us that we are more than likely to know how a player will turn out when he gets to the age of 20. When a player is younger then his personality can still change, his attributes should also be more rounded when he gets to the age of 20. A player can look great at the age of 18 but if he does not develop for a couple of years, when he does hit 20, he can look very average indeed. There are several considerations you need to make when sending out a young player on loan. Is the level the player is playing at a good level for him to develop? This is very important. There is no point in sending a player who can play at league 1 level to a league 2 club or a Championship club. They might have a good average rating at a league 2 club but are they playing against good enough players and are the training facilities good enough at that club? The player could also struggle in the Championship, so just loan him to a level where he will be challenged but its not too difficult for the player. Will the player play week in week out? This might sound simple but just make sure your player will be playing often, the reason to loan out a younger player is so he can get game time, there is no point in loaning out a player if he is not going to play too much when out on loan. Make sure you have a recall from loan clause as part of the loan contract. 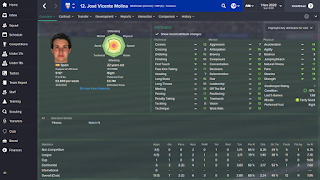 Does the club you are loaning the player to have good facilities and a good manager? These two things are very important. Make sure the manager of the loan club is good at working with youngsters and also make sure the club has good training facilities. If you are a top team then clubs you loan players to are not likely to have facilities anywhere near yours, so at least look at the manager of the club you are loaning the player to. Many people do decide to keep their youth players at their club to develop them, instead of loaning players out. I know from experience if players are not playing then they will not develop. If you cant give a young player at least 10 starts and lots of sub appearances per season, then loan him out.